ERDC Maybe Settling with the Last Defendants! 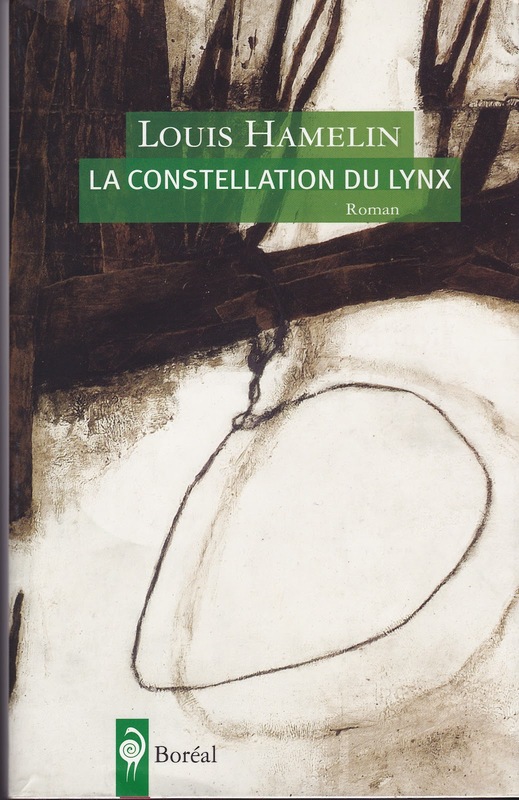 And one place to consider it will be the book discussion I'm leading Tuesday, May 8 at Outremont's Bibliothèque Robert-Bourassa: La Constellation du lynx by Louis Hamelin. 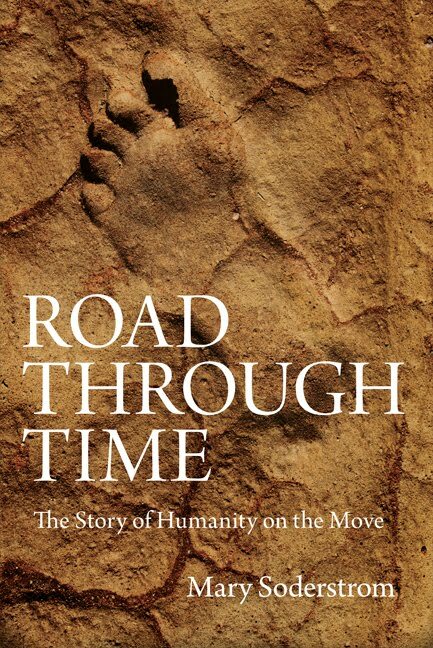 It's a long, but fascinating read, so far only available in the French original. But, as for all the causeries litteraires, you don't have to have read the book to join in this conservation about a book. Hope to see you there at 7:30 p.m. And bring your ideas for next season's discussions, as this is the last one of the 2011-2012 series. Going back to school is something that young people have done in the past when times are bad and tuition is low. It has been a case of making lemonade from lemons since what the students learn will make them more productive in the future. But the door has been slamming shut in the US, and it looks like the Neo-Liberals in Quebec want to do the same. A sizeable percentage of post-secondary students here have been on strike or boycott (take your pick) for the last 11 weeks. The government is being intransigent, figuring, it seems, that eventually the movement will fall apart. There have been hundreds of arrests, but in the last few days, students and police have begun to work together to isolate trouble-makers (agents provacateurs?. ) Today one group plans on giving roses to the cops. It's worth noting that all young policemen in Quebec have been trained in publicly-funded institutions whose fees will be going up too. 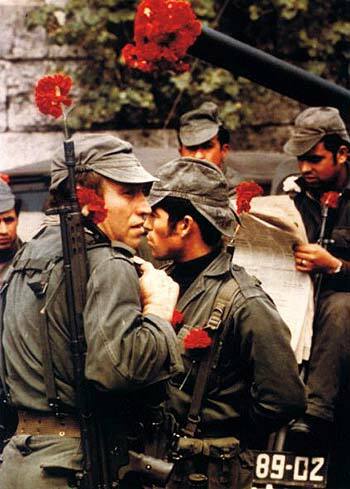 The photo above is the famous shot of soldiers in Portugal during the amazing Carnation Revolution, when a military-led revolt brought about peaceful regime change when almost the entire population responded joyfully. I'm not saying that kind of thing will happen here, but there is something to be said for solidarity when your interests are similar. BTW, note that music students from Montreal several music schools (not all of which are on strike) joined together Sunday play Stravinski's Rite of Spring. A nice bit of solidarity there too, as well as play on words: the title in French is Le sacre du printemps and sacré is one of the harsher swear words here. I must get out and take more spring pictures. The weather was hot and dry, but the last week we've had rain and cool temperatures, which last night dropped below freezing. The effect on plants has been interesting. Forsythia burst into bloom and lasted far longer than usual. Grass languished, however, until the rains came. Now the lawns are lushly green, although the coverage is still spotty. The cold overnight seems not to have too much damage, thank goodness. A tulip in front which had leaned over faced with freezing has now straightened up with the arrival of the mid day sun. Paul Krugman, Nobel laureate for economics, has been trying to convince policy makers everywhere that austerity is bad for economies. In his column in The New York Times today he points out that "All around Europe’s periphery, from Spain to Latvia, austerity policies have produced Depression-level slumps and Depression-level unemployment; the confidence fairy is nowhere to be seen, not even in Britain, whose turn to austerity two years ago was greeted with loud hosannas by policy elites on both sides of the Atlantic." But today he's cautiously optimistic because "the confidence fairy" that was supposed to magically restore confidence and stimulate private investment seems to be finally seen for the naked empress it always was: "Suddenly, everyone is admitting that austerity isn’t working." One of the those people is Canadian Parliamentary Budget Officer Kevin Page. His latest report says that while Conservative fiscal cuts will bring down the deficit, they also will mean enormous job losses, with more economic problems down the line. ""The PBO expects that restraint and reductions in government spending on programs in Canada will act as a drag on economic growth and job creation, pushing the economy further away from its potential (gross domestic product) and delaying the economic recovery," the report says according to the CBC. Interestingly, The Globe and Mail story on Page's findings made no mention of the damage caused by austerity, but concentrates solely on the deficit drop. It would seem that even when the evidenc is right in front of them, some members of Canada's chattering class haven't got the message about the confidence fairy's demise. This morning, underneath a banner story in Le Devoir about continuing conflict between student groups and the Quebec government over tuition fee hikes, I was encouraged to read a report that organic agriculture can be as productive as agriculture using chemicals. What I didn't pay too much attention to were the nuances that journalist Pauline Gravel noted: yields reported in the 66 studies included in the mega-analysis (just published in Nature) were just about as good in fruits like strawberries and oil seeds like soy, but that they were lower in cereals and vegetables. 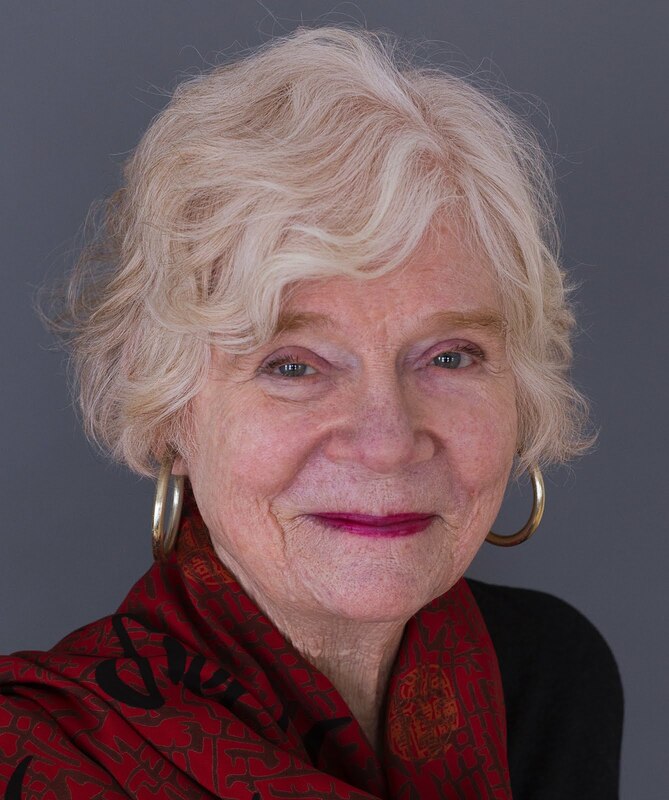 Her headline read, "When organic agriculture is a productive as traditional agriculture." The original Nature article was headed "Organic farming is rarely enough: Conventional agriculture gives higher yields under most conditions." Both headlines are correct as far as they go, although it's clear that the Nature article can be used to barying ends. But does it mean that because wheat doesn't grow as well unless it gets nitrogen-rich fertilizer, we should not clamour for strawberries, tomatoes and root crops grown organically? Not at all. There are externalities involved (like transportation costs and chemical runoff) that weren't considered in the studies. Nor was the matter of taste raised. As for me, I'm looking forward to August when the local organic tomatoes are in season: now, that's real eating. A friend sent me this link, and I'm charmed by the idea of so many people on one side of the word singing a work written by someone from a culture on the other side. Music is great! Okay, the Harperites are going to close prisons because their crime-fighting measures (which are just taking effect) have made the country safer, or so they say. Nowhere do they mention that crime, as reported in Statistics Canada data that goes back decades, was at an all time low when the Conservatives were crying "Help, help" as they frightened people in to voting for them. So it probably should be no surprise that they're also wacking a hole in the Statistics Canada budget--8 per cent off the top, which is more than other services are getting--and sending a message to other departments that they won't be penalized for cutting back on their use of Stats Can data that they must pay for. This is just more of the "don't confuse me with the facts" game plan of the Conservatives. If you don't have facts you can say whatever you want to. It's up to us to point out just what a smoke and mirrors game is being played. 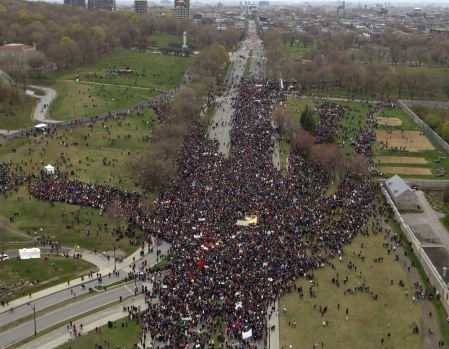 A Couple of Hundred Thousand Out in Montreal on a Miserable Day: the Quebec Spring? Having spent more time than I care to say marching in demonstrations that most frequently brought together only small groups, I've been very impressed by the crowds that have been turning out in Quebec lately. There's a student strike on against tuition hikes, with smallish demonstrations nearly every day, but just a month ago some 200,000 or so got together in a show of support that hadn't been seen since the demos against the war in Iraq. Since the weather that day was gorgeous, some commentators downplayed the numbers: just people wanting to get out on the first warm day of spring. But yesterday an even bigger crowd showed up for the Earth Day demo, and the weather was simply foul. It had rained hard in the morning, and the afternoon was cold and damp, but that didn't stop people. I wasn't there because of other engagements: it warmed the cockles of my heart that my presence wasn't needed to make the point! All this is not unconnected, it seems to me, to the greap leap voters in Quebec took not quite a year ago in electing so many New Democrat MPs. People want change, and are willling to vote with their feet. How they will vote in a provincial election remains to be seen. There's a new right wing party that may attract some protest votes, but anybody who's thinking should see that the only party with a platform in line with the expressed opinion of so many people is the left wing Québec Solidaire. Several times over the last decade we've been in the middle of preparing to go to France for a while. I'd love to be doing that right now, but there are too many things to do here to travel. So what I've begun to do is look through my old travel photos as a not-very-adequate substitute. 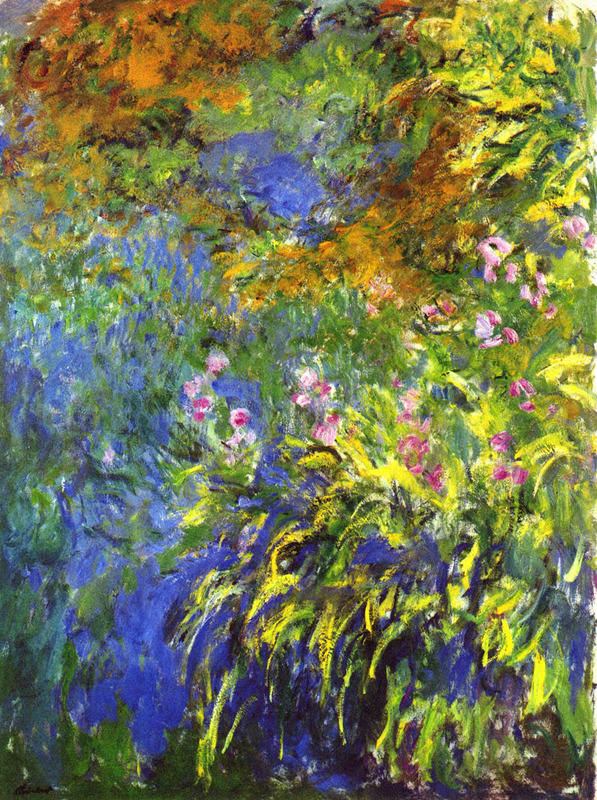 This one, taken in Monet's garden at Giverny, seems particularly approriate. We're still a long way from having blooming iris (mine usually flower in late June) but I love the way the light on new leaves has been spectacular this week. Parking on our street is a topic of hot discussion at the moment. I won't go into the details--too boring for those of you who don't live here--but suffice to say that Outremont wants to start charging for pemits for visitor parking. This has caused the idea of parking on both sides of the street to resurface. One of our friends has suggested the street needs to go on a "road diet" in order to slow traffic down. It's something I've got to learn more about it, but in the meantime I couldn't resist this cartoon from Cartoonstock.com. Yes, it was a hot month. I don't remember ever wearing sandals in Montreal in March, but I did. And despite the fact that temperatures dropped after the incredible week that spring arrived, they've been high enough so that forsythia is in bloom now and trees are just at the point of leafing out. The US government climate agency reports that "Warmer-than-average conditions occurred across nearly all of Canada, the contiguous United States, Mexico, Europe, Argentina, Peru, and parts of northern and central Russia, India, China, and eastern Brazil. Cooler-than-average regions included Alaska, Australia, eastern and western Russia, and parts of New Zealand. " It adds: "record and near-record breaking temperatures dominated the eastern two-thirds of the nation and contributed to the warmest March on record for the contiguous United States, a record that dates back to 1895." Here's an animation showing the locations of each of the 7,755 daytime and 7,517 nighttime records (or tied records) in sequence over the 31 days in March. Consultation is extremely important in planning our future: witness the way that the Harperites have just undermined environmental reviews by changing the rules. But one thing I didn't expect to find was a lovely little gallery of urban gardens on the website of Montreal's agency which runs public consultations (OCPM.) The agency will be holding a consultation on urban agriculture in May and June so the gallery makes sense. Now that the spring is well and truly upon us, it is a delight to see what people are doing with their small spaces in the city. Joyce Carol Oates is the grand winnter of this year's Blue Met prize for a lifetime of literary creation. 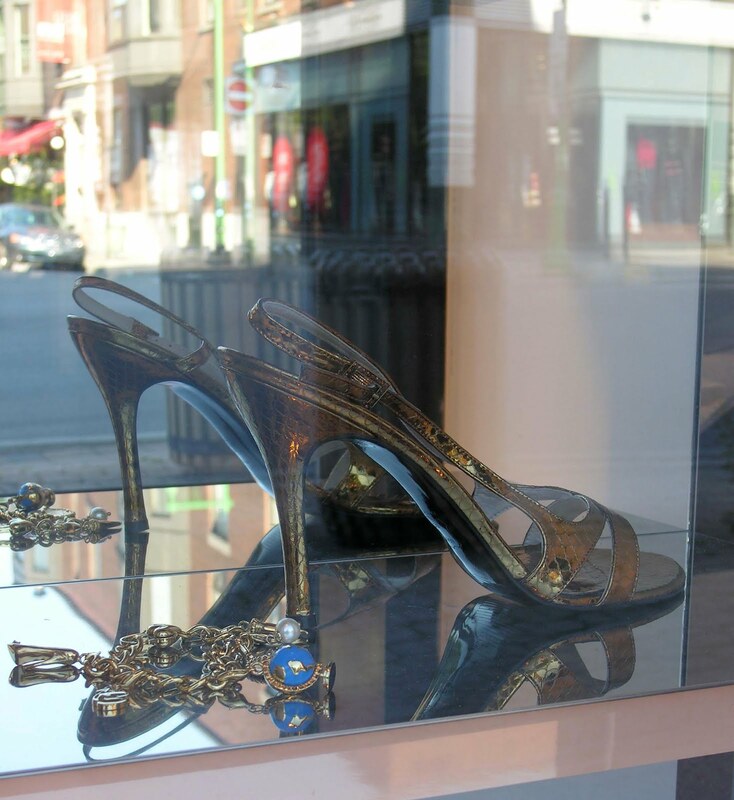 The Blue Met festival is gearing up at the moment, with a benefit tonight that spotlights shoes, actual and literaray. Sounds like a bit of a flibbertygibet idea, but as a shoe lover, I wish it well. While the rest of the country dithers about how much to support child care, Quebec's program of $7 a day, government-supported centres, supplemented by generous tax breaks for fees paid to private daycares, have meant an increase in the labour force participation rates of women which has spurred the economy. The study was reported at length in Le Devoir last week, and should be read both by family-advocates calling for better quality, more accesible day care and by penny-pinching government bean-counters. The trio of economists who wrote the report--Pierre Fortin, Luc Godbout and Suzie St-Cerny--are far from being left-wing radicals. They spend their time studying the tax system and public finances, not leading marches in favour of social programs. Google informs us today that it's the 100th anniversary of photographer Robert Doisneau. 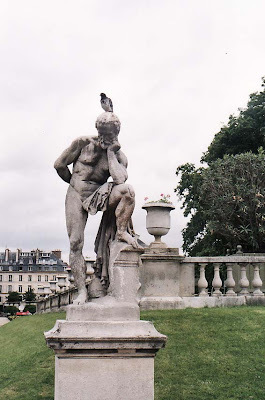 His emblematic photos of France, particularly of Paris, have been favourites of mine. 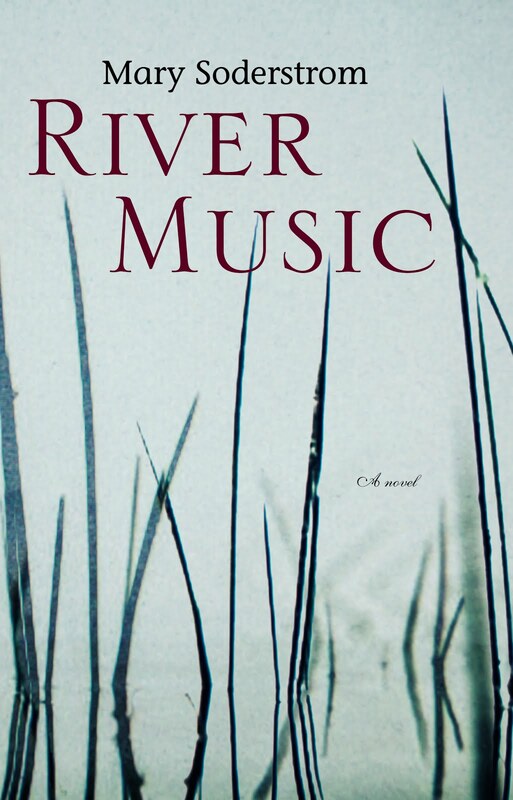 This was book group week, and an engagaing tale by Quebec writer Denis Thériault was the subject in the original French (Kirkland library) and in English translation (Atwater Library. Le facteur émotif (AKA The Postman's Round) tells the story of a 27 year old postman who becomes obsessed by writing haiku to a woman in Guadeloupe. 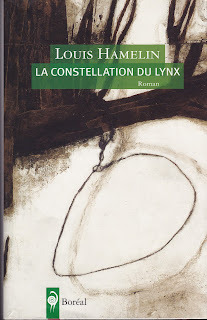 It's funny, intelligent and rather weird, and it started out, according to Thériault, as a book about solitude. 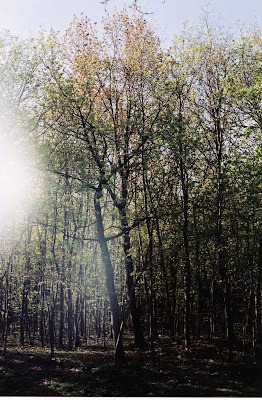 In an interview given in Germany in 2010, Thériault says that he is quite different from his hero--not at all solitary, he works in television and is the father of a family--but that solitude was a theme he wanted to explore. And obviously it is a subject that touches many people. In the two discussions this week, the plight of the hero was much commented on, both positively and negatively. For those worried about solitude, this week's The New Yorker is accompanying required reading. "Why Are So Many Americans Single?" the magazine's Nathan Heller asks, after citing statistics about the striking increase in the numbers of people living alone. Many of these people are widowed, divorced, or simple loners who have either chosen or backed into their solitary state. They have the option of not sharing their lives, because they can afford to live alone. I wonder if the current economic recession will affect those who can't. Two together can live more cheaply than two apart, a fact that may become more important as incomes stagnate and the middle class becomes poorer. The same sort of dynamic operates when the young move back in with their parents in hard times--or never move out at all. We're almost to the point when the trees will leaf out, two weeks or more ahead of usual. The importance of trees has been unlined this week in two stories in The New York Times. The other, published two days later, is called "Why Trees Matter," and details the positive benefits of trees. A few you may not know about include: decomposing leaves that leach acids in to the ocean, fertilizing plankton. " When plankton thrive, so does the rest of the food chain. In a campaign called Forests Are Lovers of the Sea, fishermen have replanted forests along coasts and rivers to bring back fish and oyster stocks. And they have returned"
Then there is the way trees filter water. 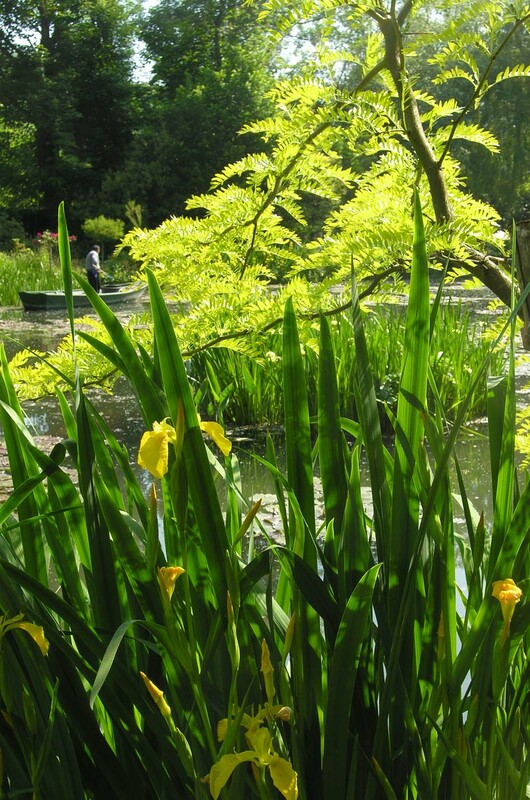 They are "capable of cleaning up the most toxic wastes, including explosives, solvents and organic wastes, largely through a dense community of microbes around the tree’s roots that clean water in exchange for nutrients, a process known as phytoremediation." But many trees are in trouble, partly because of heat and drought, just as their benefits become more needed. All right. Haven't got much room left for trees in our little yard, but I think we'll plant a cedar hedge instead of replacing a fence between us and the neighbors. Excuse me while I do a little Googling in preparation for gardening. What a waste of time, all this stuff about the 10th anniversary of the sinking of the Titanic. Is it because it seems so gratuitous? Three years later another big ocean liner went down, killing just about as many people. When the Lusitania was torpedoed by the Germans, 1,119 people of the 1,924 abooard died. Compare this to the 1,514 who died on the Titanic which was carrying 2,224 people. 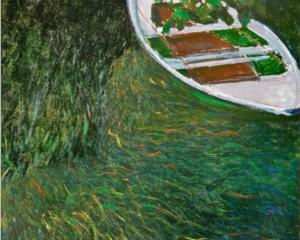 Willl there be as much hoopla about this 100th ananiversary? Probably not, if onllyl because the Germans are our friends now, and the Lusitania sinking was used to ratchet up anti-German sentiment since it was wartime. More importantly, some pretty impressive amounts of cash are being spent by the CBC and other news outlets to cover the Titanic commemorative ceremonies. That is money that would be better spent in covering the wars and near-wars that unfortunately continue even though the 1914-1918 war was supposed to be "The War to End All Wars." Frank Bruni has an intersting appreciation of Craig Claiborne, his legacy and his life today. Claiborne was one of the big three inmid-20h century American cooking, the others being James Beard and the wonderful Julia Child. I have two well-thumbed cookbooks by Claiborne. Cooking with Herbs and Spices is brought out many times a year, but particularly in June when the mint is lush and flavourful so I can make mint and lime sherbet. His The Chinese Cookbok (with Virginia Lee) is one I haven't used much lately, but it taught me much about that cuisine. And for years I read his columns in The New York Times avidly. But Bruni says that Claiborne lacked that ingredient for a fulfilled life: partners to share it with. I had not known that: what a shame. While my culinary adventuring is tame compared to his, I must count myself lucky to have loved ones to cook for. That's something to think about when it seems that my various projects are stalled. So in honour of those who like what I make for them, here's Fanny Brice singing a song that it seems Claiborne didn't have a chance to sing often. Mrs. Ikvilds' eggs are the best. 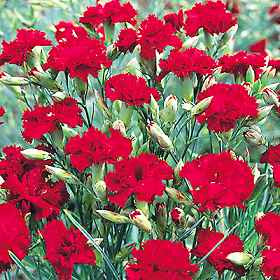 I couldn't believe how lovely the mottled red colour was. She says she sometimes puts celery leaves on hers, so the dye doesn't enter the leaf-protected part. That sounds really nice, but even with my experimental attempt, I got a subtle flower pattern on one of the eggs, I guess because of the difference in the onion skins it was wrapped in. According to one site, red onion skins were supposed to make green, but made red instead. Beets made a light pink, that wasn't as nice as the onion skin colours. 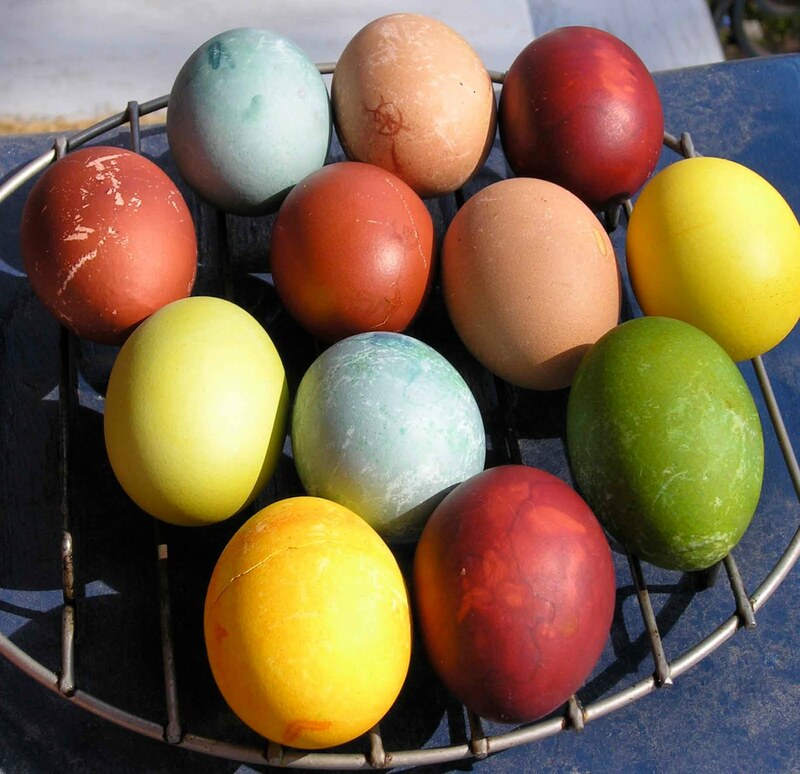 Two tricks: use hot dye or boil the eggs in the dyeing mixture, and leave them there for an hour or more. Don't skimp on the vinegar either: it is a dye fixative anyway, but it also softens the eggshells slightly and allows the dye to enter more easily. One strange thing: the blues got progressively darker as the eggs dried. One of the pleasant memories of my childhood is dying Easter eggs. When the kids were small, we did it too, frequently with friends who'd share an Easter dinner with us on Good Friday or Saturday and who had kids too. But when everyone grew up I put that aside. But Jeanne is here, with Thomas/Léa in prospect so I've started thinking about doing eggs again. Last night our Latvia neighbor came over with Easter greetings and the story of how eggs are dyed in Latvia with onion skins. Well into her 80s, she will do just that tomorrow at her brother-in-law's place to take to an Easter breakfast at the Latvia church. So I've been inspried and at the moment there are two pots on the stove, one with onion skins and the other with beets, that are supposed to make interesting Easter eggs. I'll report tomorrow, perhaps with a Saturday photo. Here's a link to one set of recipes I'm using, And another to a story about how Latvians do it. Sometimes things improve, believe it or not. One of them is the way that people here, at least, pick up their dog poo now. It used to be that when the snow melted, five or six months worth of dog were uncovered, ready to fester in the spring sunlight. Walking down a residential street was enough to make you gag until either a heavy spring rain washed to waste away, or property owners got fed up and cleaned the mess up. But that's not the norm any more. Some boroughs have fined heedless dog owners, but I think the change also comes from people being just a bit more ecologically aware. The New York Times has an intersting story about a dog poop composting project in a park in Ithaca, N.Y. Seems that dogs visiting Allan H. Treman State Marine Park produced 12 tons of poop over 18 months, which owners put in biodegradable bags for composting. The result wasn't a stink but two truck loads of pathogen-free compost, good for flower and vegetable beds. As some of you may know, I've been involved in the New Democratic Party for years. The Outremont riding association has been around for almost as long, but until the last few years--with the arrival of Thomas Mulcair as our MP--activity has taken a quantam leap. From a membership of 200 last August, we've grown to about 1400. Now that Tom is the leader of the official opposition, we've got even more to do. That's why our bulletin has become bigger and more frequent. Here's the link to it. Not much of a post today as I have to go to court in the Electronic Rights Defence Committee's 15 year old (almost to the day: we filed April 7, 1997) class action against The Gazette and its various owners. At issue is electronic use without payment or permission of stories published in The Gazette. We appear to have settled with the last of the defendants, and now Quebec Superior Court must approve the settlements and authorize the next steps in the process. Maybe by this time next year, we'll be all done with the issue, with some relatively handsome payments going to freelance writers who wrote for the newspaper. Maybe it's the slightly warmer weather, which means that girls and women aren't so muffled up, but I've lately been struck by the care that nearly everybody under the age of 50 lavishes on her eyebrows around here. I remember that last year springtime brought into evidence the wealth of tatoos that males and females have been bedecking their bodies with. This time what I'm seeing isn't as drastic, but still is striking. No, tell you what: you younger folk take care of that, and I'll worry about stuff that's worth raising your eyebrows about. 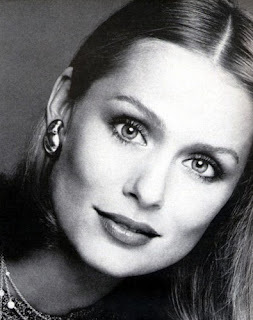 The photo, by the way, is of Lauren Hutton, who according to one beauty site, had perfect 1970s eyebrows.